AUDIENCE: With its spotless contents and affordable price, it should be a standard handout for every puppy class client. 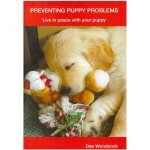 SUMMARY: Pocket-sized booklet teaching puppy owners how to avoid and deal with common puppy problems using modern methods. This book is not only insanely useful, it’s also insanely small. Whatever her secret is to compact so much good stuff in so little space, I want in. She covers all the crucial areas in a breezy, uncomplicated style that hits the spot again and again. Given the date of edition (2002), many authors were still obsessed by punishment-based methods and the pack theory but… Not so Dee Woodcock: the advice she gives is rational and well-informed. Management: Crate training, house training, setting boundaries, etc. Training: Methods to teach the crucial cues (sit, come back, etc.) with AND without clicker. Body language: Dee Woodcock also shares dog trainers’ secrets on the subtle body language signs that will have you read your dog like no one else in no time. Mastering body language is an invaluable tool for reading budding signs long before they develop into full-blown problems, and the author does a great job at covering the subject in just a few lines. Addressing typical puppy problems: Humane and effective tips on dealing with typical complaints like jumping up, play biting, begging, separation intolerance, stealing, chewing, etc. My one gripe: I wish the pictures were illustrating the local text, rather than all condensed in the central section. Browse the Book Review archive. Genre: owner manual. Author: Woodcock Dee. Reading Level: Owners. Star: 4. Bookmark the permalink. Post a comment or leave a trackback: Trackback URL.